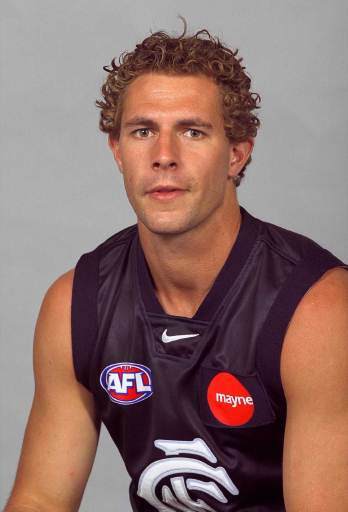 Originally from Melbourne Grammar (he also played for East Camberwell), Simon Beaumont was taken with Pick 18 in the 1993 National Draft, a period in which Carlton still seemed a little shy of embracing the draft. Whilst our foes the Bombers were busy with early picks, Carlton still seemed to be stuck in pre-draft days. With that in mind, "Beauy: was a luxury. The other Carlton player drafted in this draft was Matthew Hopkins (pick 48) who broke down within the first five minutes of the first practice match at Skinner Reserve and never played at Carlton. Drafted as a forward from the Under 18's (Central Dragons who was coached by Ray 'Slug' Jordan), it took Beaumont a few years to make the grade - although it was in a very strong Carlton team that Beaumont would debut. His debut came in 1995, with 2 games, (the first game was against Hawthorn at Waverley in Round 10, 1995 after Carlton had lost the previous two games (and only games they lost for this season) and he was aged 19 years and 173 days in this 102 point victory) and then he played a further 7 games in 1996 and 1997 respectively. 16 games in 4 years was perhaps a bit light on given expectations, but Beaumont had had to endure constant problems with his groins and a bout of osteitis pubis. 1998 proved to be the turning point for Beaumont. At 189cm and about 85 kilos, with an exceptional turn of speed for his height, Beaumont played a variety of flanker roles. An 8 goal half - yes, half! - against the Pies at the MCG was a mystical, magical day where this otherwise unknown player tore the Collingwood defence apart with a few marks on leads and freak left foot snaps. What made it even more odd was that he couldn't crack it for a single one in the second half, notwithstanding that the game was ours and the pressure dissipated. 1999-2001 was a golden period for Beaumont, but mainly in the guise of a key defender. Although considered short for this role, Beaumont played 'above his height' to use a footy colloquialism and gradually assumed a key defender role, sometimes taking full forwards (Lloyd) and even CHB. His shaky kicking at times remained, but it must be said that he was often in the best players in a final team. 2002 is a useful year to analyse for Beaumont. Whilst Carlton collapsed to our first Wooden Spoon, Beaumont was seen to play amongst his best year of football - he brought up his highest average stats count and came 4th in the Best & Fairest, demonstrating how important Beaumont was to Carlton and the roles that he had taken on. In 2002, Simon's younger brother James Beaumont played three games with Carlton's reserves team. But come 2003 and it all changed for Carlton, and it must be said, Beaumont. New Coach Pagan took over from Brittain and although Carlton remained on the bottom of the ladder, rumours of dissension swept the press on occasion. As the hopelessness of this era began to permeate the Club, a massive trading period was undertaken by Pagan and the Club and a number of proven and experienced players found their way outside of the Club. Beaumont - a proven defender, was traded away in a 3 club trade for David Clarke jnr of the Cats. Simon Beaumont played his last 133 Carlton games uninterrupted over five seasons from Round 8, 1998 to Round 22, 2003 and also played the following 11 senior games at Hawthorn before missing the Round 12, 2004 game against Carlton after being suspended for striking former teammate Justin Murphy in a spiteful game against Essendon when Hawthorn "drew a line in the sand". Beaumont remains second on the list of Consecutive Carlton Senior Games played. Regardless of finishing his career elsewhere, Beaumont was a utility and more than a servicable defender for the Blues who played 152 games - many in a strong team for Carlton who were just unable to secure a Premiership. This in itself is a great effort and in time people should remember Beaumont as the above average player with the shaky left who kicked 8 against the Pies in the first half. He would also hold the Games Record and Goals Record for Guernsey 29. Beaumont went on to play 2 seasons for the Hawks, before retiring at the end of 2005. He would play a further 27 games and kick 12 goals for the Hawks during his two stint. In 2009, Beaumont would play in a premiership with VAFA B Grade team Old Melburnians. Having his career book-ended by severe injuries has seen some football followers forget just how versatile and damaging Simon Beaumont could be. Whether it was taking Mal Michael apart at the MCG or subduing Jonathon Brown at Optus Oval his ability to play above his height, underestimated speed and strength and his general football smarts made him a player to contend with. Should he have played with another team in his most natural position (possibly half back) his career would (subject to injury) have seen more games played and a greater level of recognition. Contributors to this page: Bombasheldon , molsey , Jarusa , WillowBlue , nikki , true_blue24 , keogh , BlueWorld , Juzz and admin . Page last modified on Sunday 26 of May, 2013 08:14:29 AEST by Bombasheldon. 1974 - Syd Jackson's wish for a Barassi smile (pg 2 of 3). 1977 - Jezza, I'm not washed up (25/08/77).